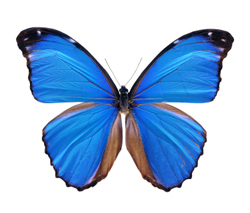 If you're looking for a change of scene next Tuesday lunchtime why not go along to hear Raymond Flood, Gresham Professor of Geometry, talk about Butterflies, Chaos and Fractals, 1pm on Tuesday, 17 September 2013, at the Museum of London. It's just one of a selection of great free public lectures given by Gresham Professors over the upcoming months. Gresham College has been organising free public lectures for over 400 years, since the time of Elizabeth I. Gresham Professors, in subjects ranging from mathematics and law to divinity and rhetoric, give a range of lectures over the 3 years they hold the chair. Many of the greatest names in science and art have passed through Gresham's halls, including Christopher Wren and Robert Hooke. We're also looking forward to hearing Carolin Crawford, Gresham Professor of Astronomy, talk about Quasars on Wednesday, 23 October 2013, at 1pm. And Flood's talk on Public Key Cryptography: Secrecy in Public on Tuesday, 22 October 2013 at 1pm, should be topical given the recent revelations of government surveillance. Looking further ahead, the lecture User Error: Why it's not your fault on Monday, 20 January 2014 at 6pm from Tony Mann, the Gresham Professor of Computing Mathematics, is particularly comforting given that I spent yesterday trying to retrieve about a week's work that was lost somewhere in the bowels of my laptop! To get you in the mood, why not read our article based on a previous Gresham lecture, Conic section hide and seek.